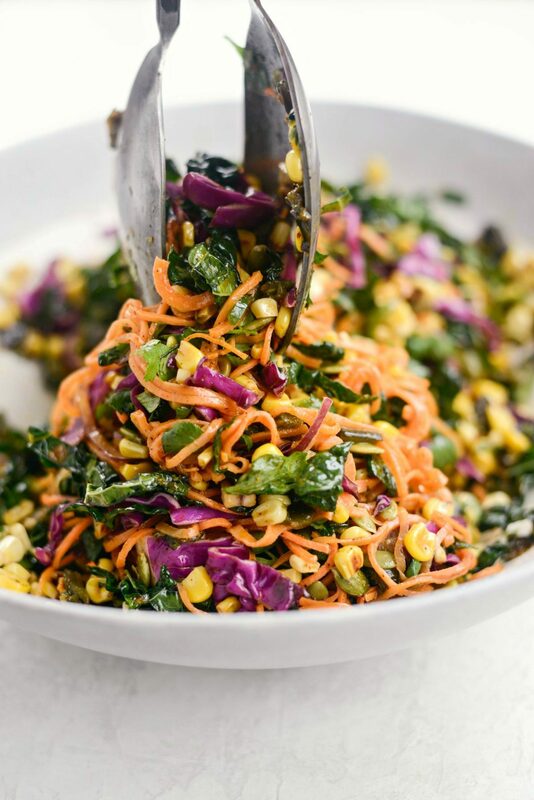 In this Mexicali Sweet Potato Noodle Salad, roasted poblanos and charred corn are tossed with sweet potato noodles, kale, jalapeño, cabbage and red onion in a simple lime infused Mexicali dressing. Fresh, bright and with a subtle smoky heat. This is me: buys a spiralizer 8 months ago and just now getting around to using it and on the first day, I sliced my finger. I literally ran my pinky finger down the blade. Why? Sure life could be worse than an inch long incision that I have to cover with a bandaid, but YAY! 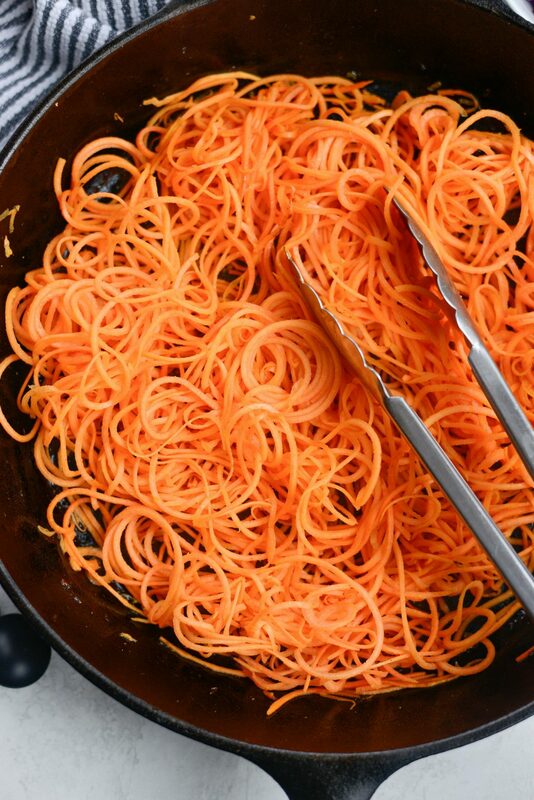 to finally getting around to spiralizing! I’m not one to follow trends. 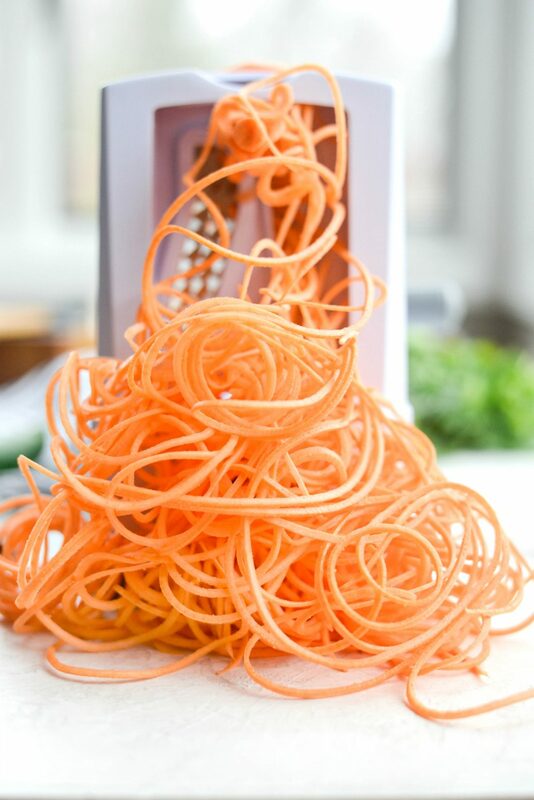 HOWEVER I am all about easy gadgets that promote healthy eating, and when I found how easy it was to spiralize (and trust me, you will too) I now want to spiralize everything. SO this is a recipe I’ve made before, but I used my julienne peeler (affiliate) and while it was tasty, it just didn’t look pretty at all. 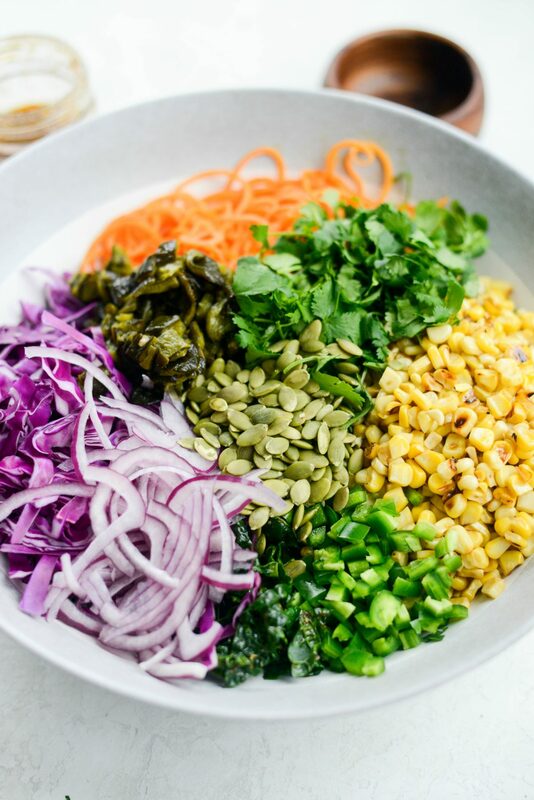 To achieve ultimate salad beauty, you’ll want a spiralizer. Not only for the fact it’s ridiculously easy to use but the aesthetically pleasing outcome is satisfying as well. I found my spiralizer on Amazon (affiliate), and I’ll admit I’m pretty impressed with it. Granted I only used it once so far, it does comes with 7 different blades so you have lots of voodling (veggie-noodling, I just made that up) options. I picked the angel hair blade, and while it worked like a champ, next time I’ll try one of the other blades. 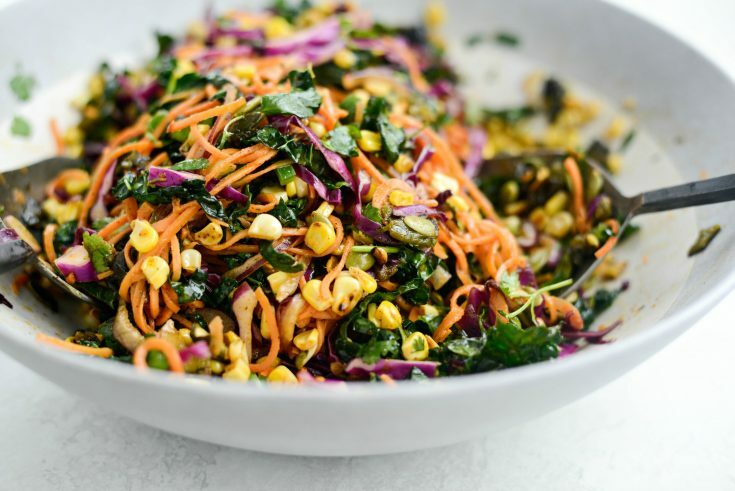 This Mexicali sweet potato noodle salad is pretty forgiving, so you can use what you have on hand in the quantities that you decide fit. 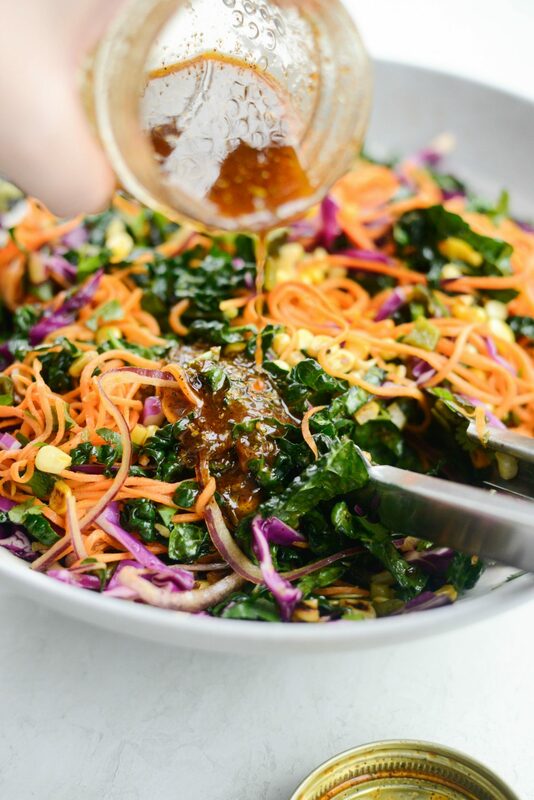 Drizzle it with this super simple lime infused Mexicali dressing and prepare to fall in love. Make the dressing first. 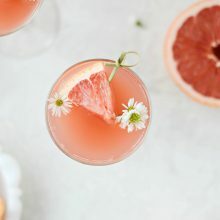 It’s easy and only 6-ish ingredients. 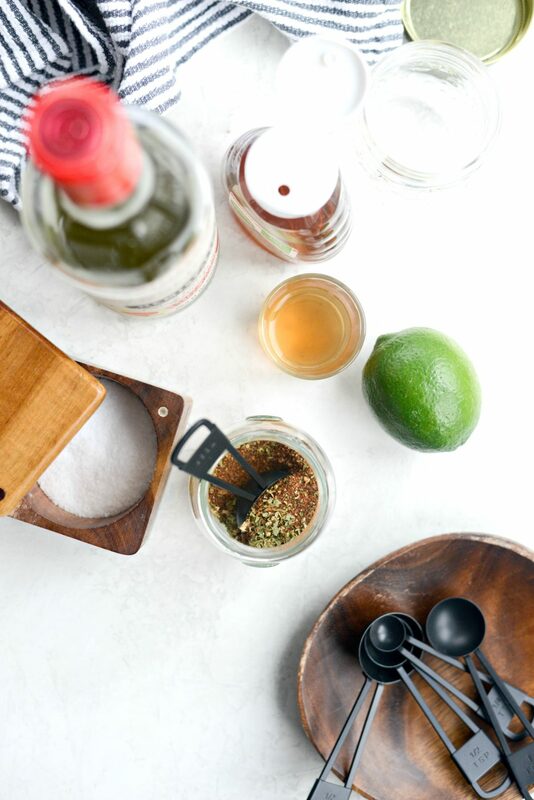 You will need; 1 tablespoon of my Mexicali seasoning, 1/2 teaspoon kosher salt, a medium-sized lime – both the zest and juice, 2 tablespoons champagne vinegar, 1 tablespoon honey and 1/4 cup of olive oil. Measure and add these ingredients into a glass jar that has a tight fitting lid and shake to combine. Let this sit so the lime juice and vinegar can start working their magic on the spice blend. 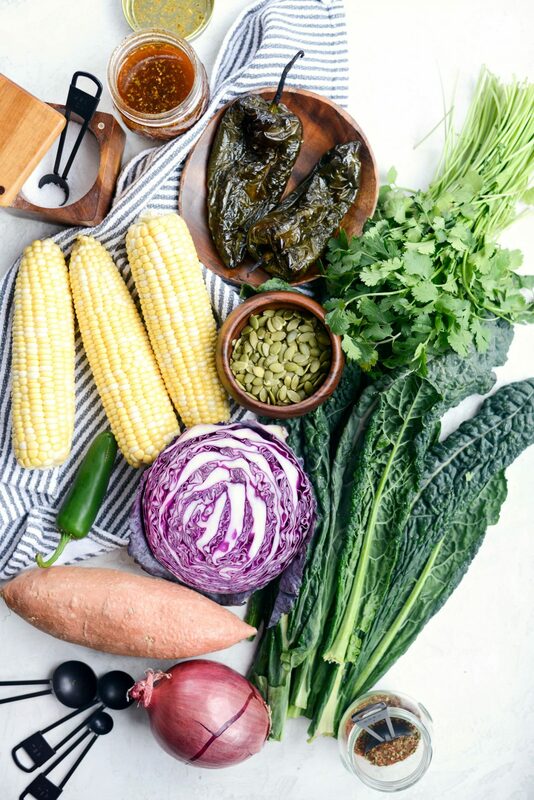 For the salad, you will need; 2 roasted poblano peppers, 2 to 3 ears of corn, 1 to 2 sweet potatoes -depending on their size, 1 bunch of lacinato kale, 1-1/2 cup cabbage, red onion, 1 jalapeño, 1/2 cup pepitas, kosher salt and the Mexicali vinaigrette. First thing I do is roast the poblanos. In the colder months, I like to use my go-to method of oven roasting by following this method. While the poblanos roast, I prep the rest of the veggies. Peel and trim the ends off of 1 to 2 sweet potatoes, spiralize on your favorite blade and set aside. I had plans to use two sweet potatoes but one was in bad condition. 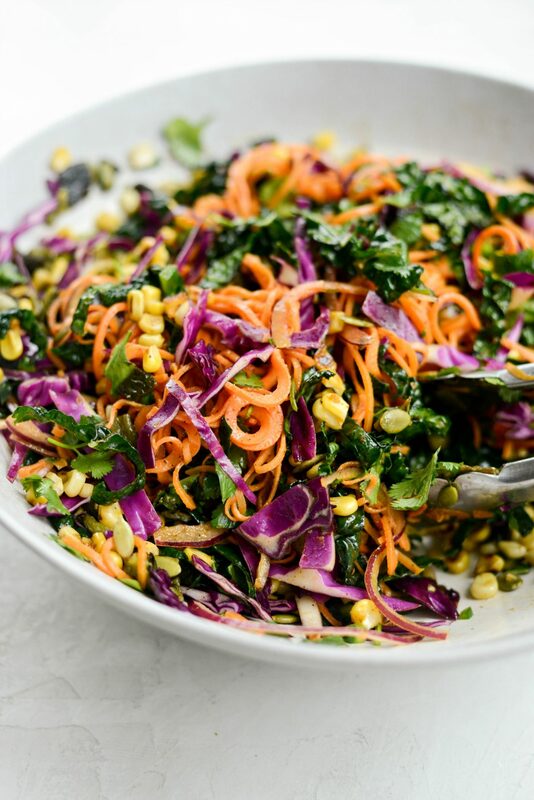 The sweet potato noodle salad was still delish with only one spiralized sweet potato. 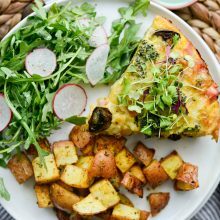 Preheat a large, 12-inch cast iron skillet with 2 teaspoons of olive oil on medium-high heat. Cut the kernels off of each of the cobs. 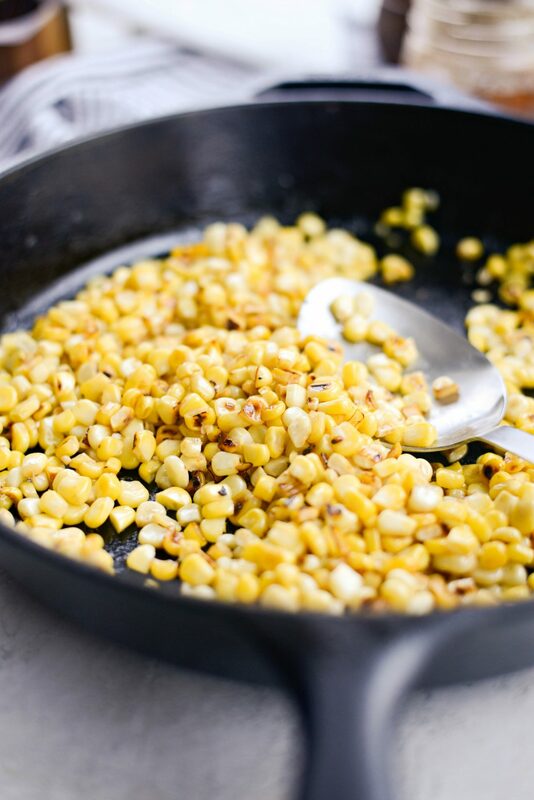 Once hot, add in the corn kernels, toss in the oil and spread in an even layer. Cook, undisturbed for 2 to 3 minutes or until a good char forms. Stir and repeat for another 2 to 3 minutes. Transfer the toasted corn to a large mixing bowl. Add 2 more teaspoons of oil to the skillet and reduce the heat to medium. 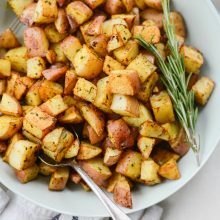 Add in the sweet potatoes, toss in the oil and cook for 5 to 6 minutes or until the sweet potato wilts a bit but still has a bit of crunch to them. Fun fact! Sweet potatoes are delicious raw! Transfer to the bowl with the charred corn. 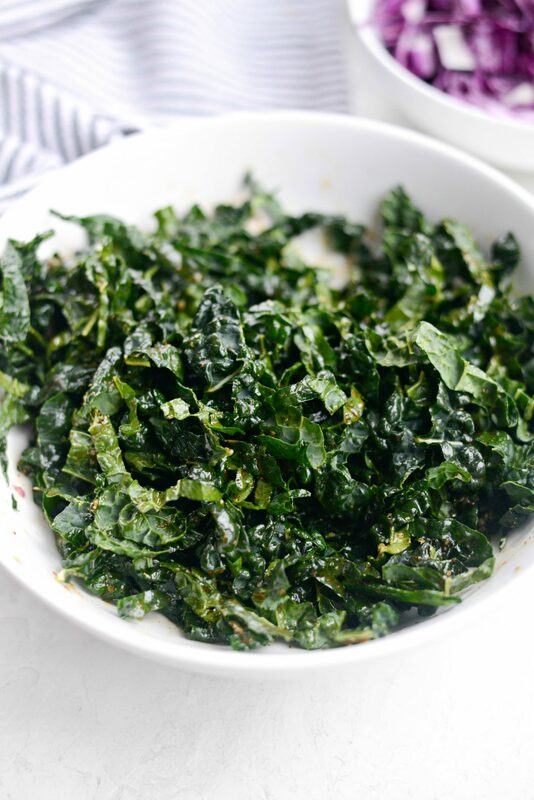 Remove and discard the stems from a bunch of kale, then thinly slice the kale leaves. Toss in a little of the dressing and a pinch of kosher salt and toss to coat. 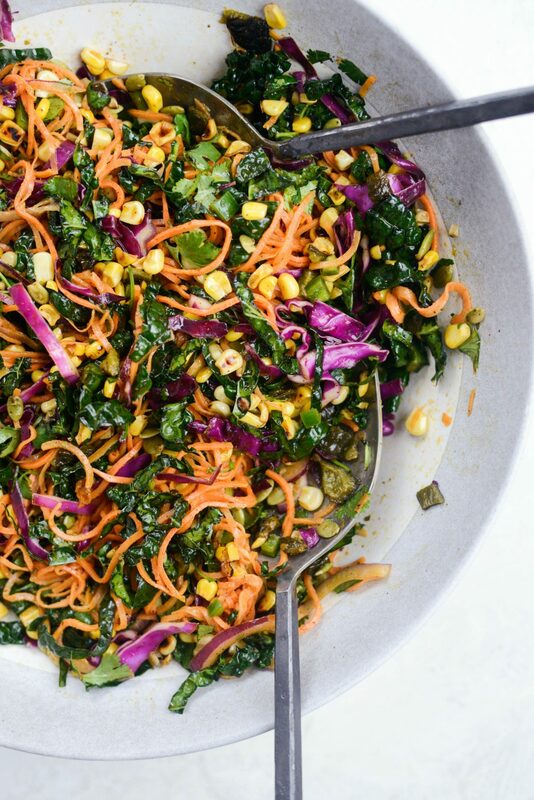 Add the kale into the bowl with the corn and sweet potato noodles. Next add in the rest of the prepared veg. The sliced purple cabbage, red onion, skinned, seeded and diced poblano, coarsely chopped cilantro, pepitas, (seeded and diced for less heat) jalapeños and a few pinches of kosher salt. Quickly toss to combine before pouring in the desired amount of dressing, which is totally up to you. 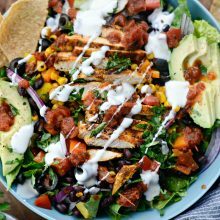 Toss the salad a few more times to incorporate the dressing and that everything is coated. Crunchy and tender, slightly sweet with smoky heat and some spice (thank you jalapeños!). 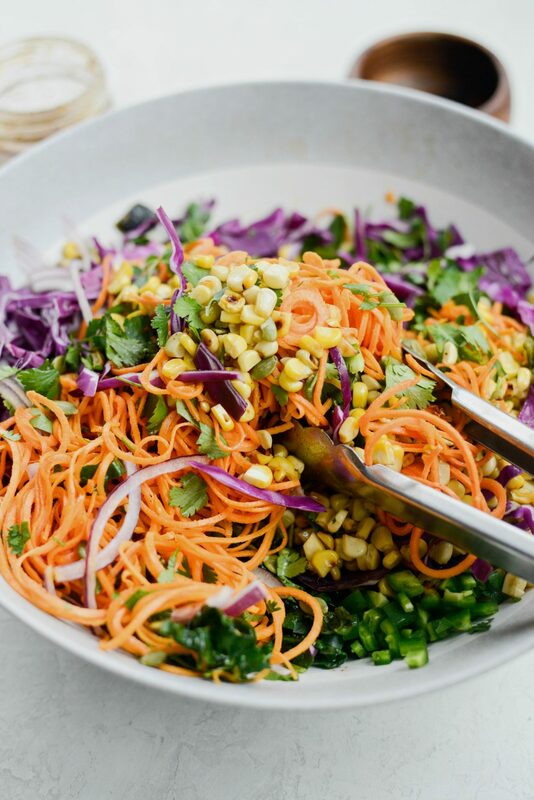 This Mexicali sweet potato noodle salad is perfect as is, but is wonderful as a side to chicken or salmon… any seafood really. And only gets better as it sits. Enjoy! 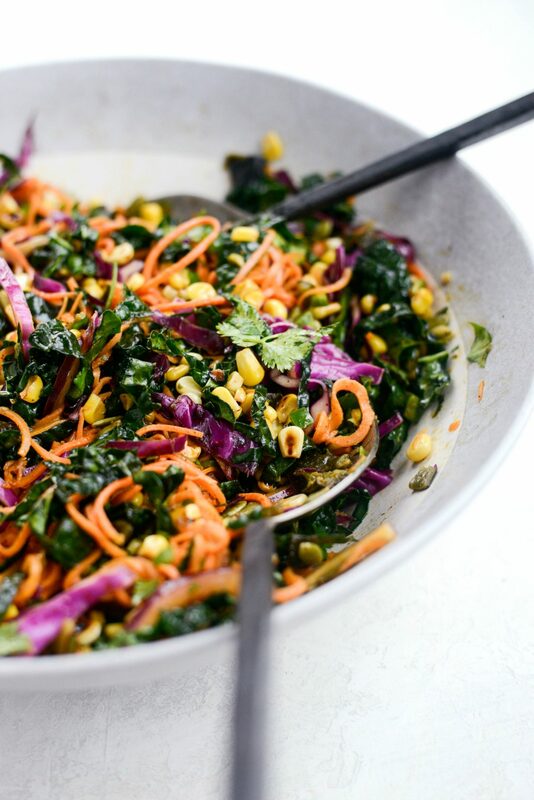 And if you give this Mexicali Sweet Potato Noodle Salad a try, let me know! Snap a photo and tag me on twitter or instagram! 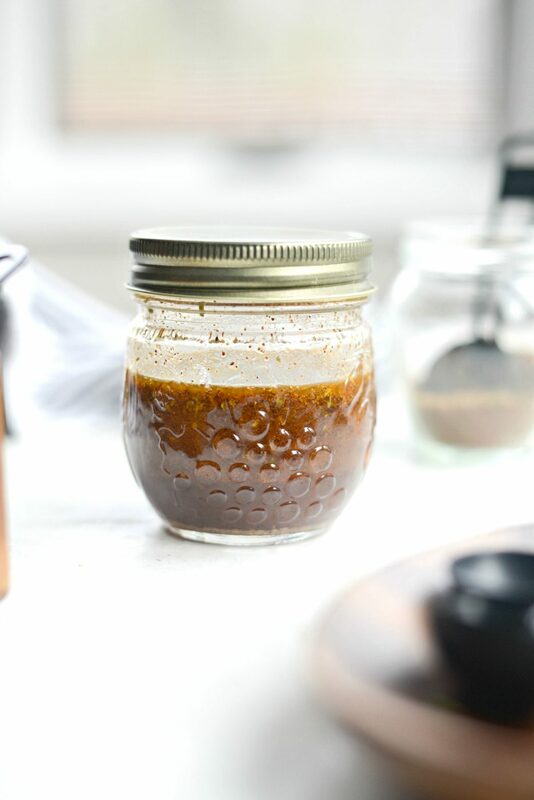 In a glass jar (with a tight-fitting lid) measure and add in the Mexicali seasoning, salt, lime zest and juice, vinegar, honey and oil. Shake until thoroughly combined. 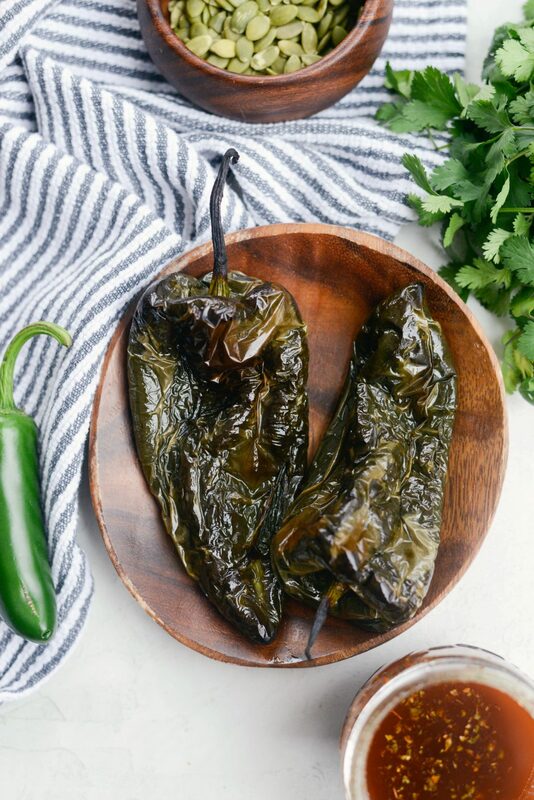 Wash and prep the poblanos for roasting (link above). While the poblanos are roasting, prep the veggies. In a large, 12-inch cast iron skillet, heat 2 teaspoons of olive oil on medium-high heat. Once hot, add in all the corn kernels in an even layer. Toast in the skillet until charred, about 2 minutes before tossing the corn and repeating for an additional 2 to 3 minutes or until nicely charred. Transfer to a large bowl and set off to the side. Add 2 more teaspoons of olive oil to the skillet and reduce the heat to medium. Add in the spiralized sweet potatoes and toss in the oil to coat. Cook for about 5 to 6 minutes (depending on the size of the sweet potato noodles) until the get tender yet still have a little bit of crunch to them. Transfer the cooked sweet potatoes to the bowl with the corn. 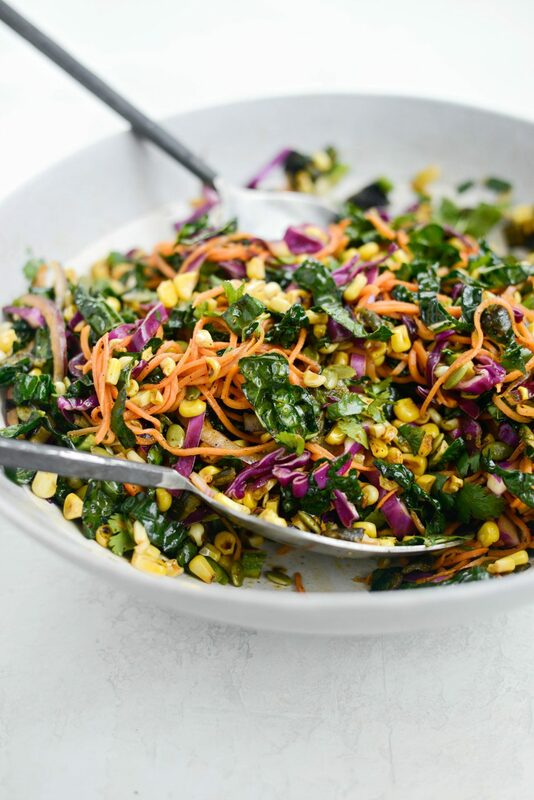 Toss the sliced kale in a little dressing and add to the mixing bowl along with the remaining veggies, cilantro, pepitas and a couple pinches of kosher salt. Toss to combine and drizzle with desired amount of dressing. This dish is imaginative and delicious! I’d take this over a Chipotle bowl anyday! 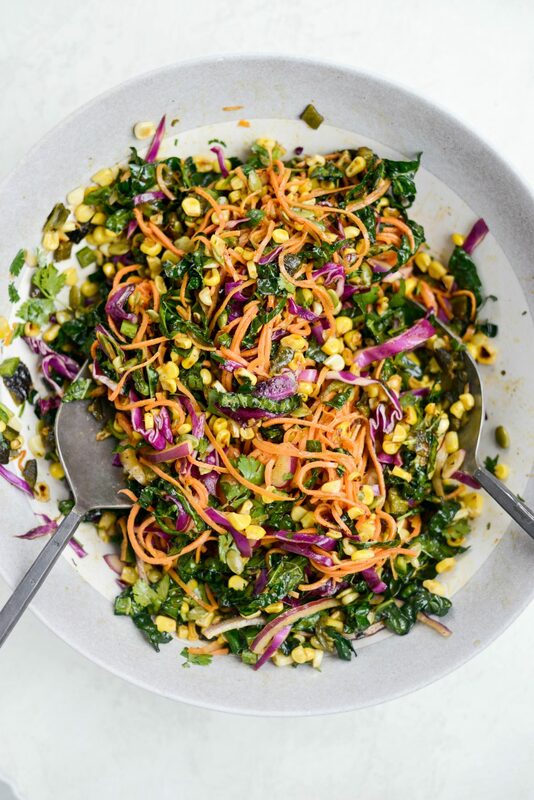 The dressing was perfect and all the colors and textures of the veggies blended perfectly together! 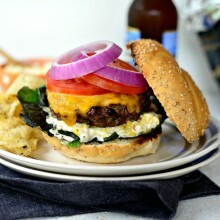 I will he making this over and over!!!! I’m so glad, Kel! Thanks for taking the time to make this recipe! My new favourite salad. This is oh so good. I could eat it everyday. Just added a bit of feta cheese for that salty, creamy bite. Thank you for the recipe. Oooh! I’m so glad you enjoyed the salad, Debbie! I like the feta addition, I’ll have to try it! This looks and sounds delicious!! 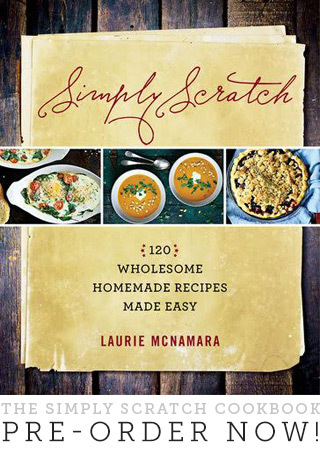 Definitely adding it to my list of recipes to try. Your photos are beautiful! 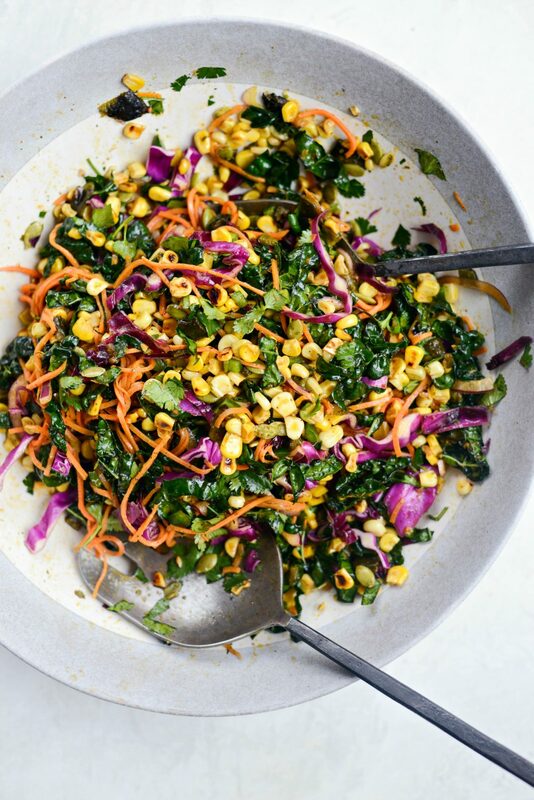 I bookmarked this recipe when it was first posted, waiting for corn season, and boy, this did not disappoint. 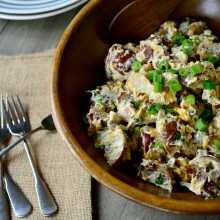 I love these big salads with lots of ingredients since they taste like something from a restaurant. It makes a lot, but that means I have lunch ready to go all week. Will definitely make again. Can see this being a big hit at a potluck or work carry-in. 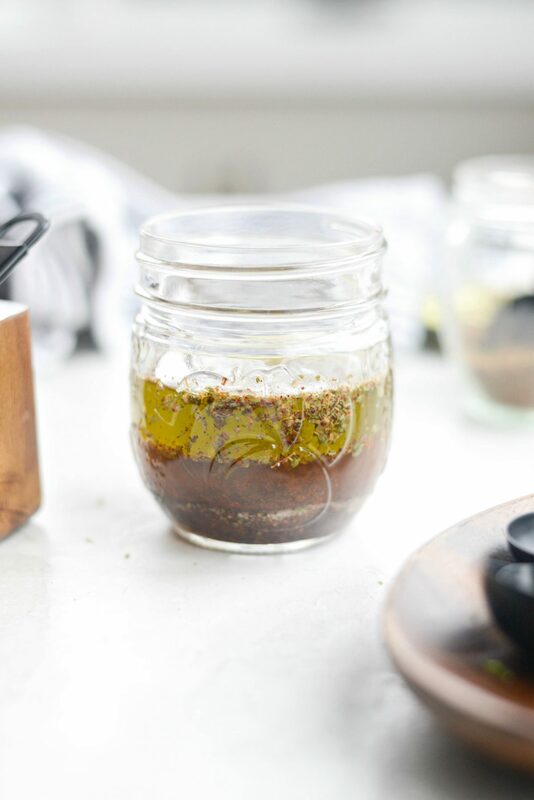 I also made your Mexicali seasoning, which I am looking forward to using in other recipes. Your recipes never disappoint. I also added Feta because I love the added flavor. Thanks! I’m so glad! And feta? Brilliant!